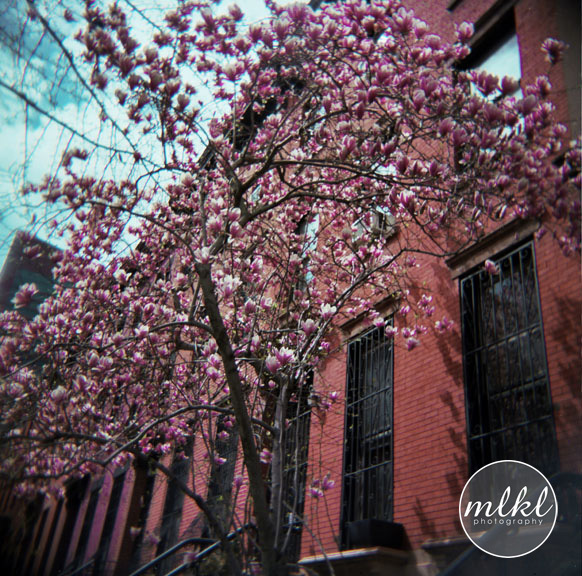 The short-lived Cherry Blossoms captured in full bloom by my ever-wonderful Holga Film camera. Spring is already in the air, and I am so excited! Unquestionably, one of my favourite weeks of the year is when the Cherry Blossoms begin to bloom all throughout Brooklyn. And, having the highest Cherry Blossom Tree count of anywhere I've seen, the Brooklyn Botanic Gardens are the mecca for all things spring-time pink! I am now scheduling spring time portrait sessions in the park! With the blossoms answering only to the unpredictable calendar of Mother Nature, these short-lived beauties may bloom any time between mid-April through early May, so tentative dates and scheduling flexibility is a must! This setting is perfect for any type of photo session - newborn, children, engagement, and family sessions alike. Plus its just in time for Mother's Day, making your images a perfect gift that you will cherish forever! To book your time slot or get more details drop by the contact page on my website. This time-lapse of Brooklyn Botanic Garden's famed Cherry Walk, created by BBG's Web Manager David Allen, was created by compiling over 3,000 digital images. Music by Jon Solo, a Brooklyn-based musician and producer.